Just a quick post tonight as I'm badly in need of an early night. Book club is on Thursday night and I've still got 1/3rd of the book to go! It's a fab read - can thoroughly recommend even though I've not finished it yet. It's called 'The Light Between Oceans'. You can hear the choir sing on the Youtube channel on this link and check out the website if you want to know where we're singing locally over the next few months. The theme this week so far has been finally wearing some heavier tops that I picked up in the sales. Yay! Yesterday was a soft and cosy cream jersey top from Joules that I bought on holiday in Portrush in July. 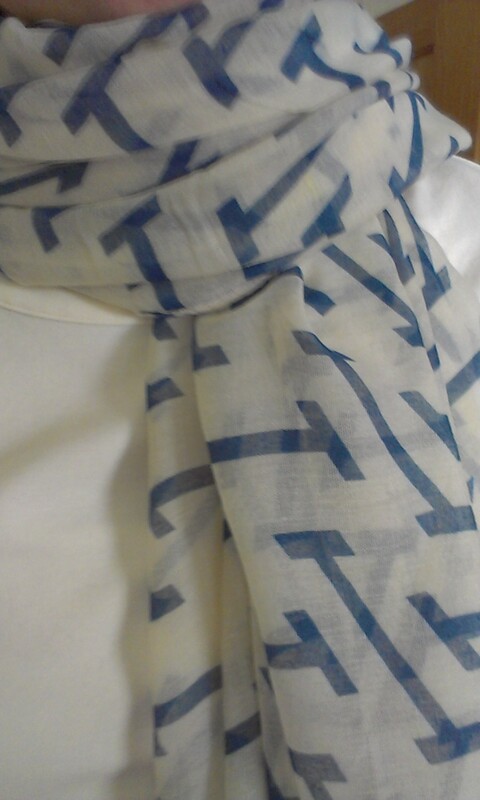 I remember sweltering as I tried it on...yesterday I had to add a scarf...the 'I' print scarf from the shop. It's a classic simple scarf that looks fab with cream. 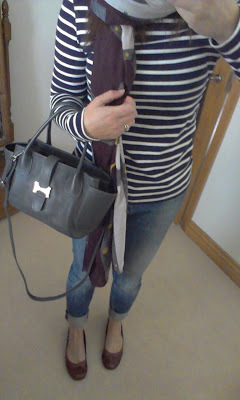 I started out in my Hobbs loafers (eBay) but it soon became clear that the ankles were not happy...so for the school run the ankle boots (Clarks via eBay) and a jacket (H&M SS12) were added. 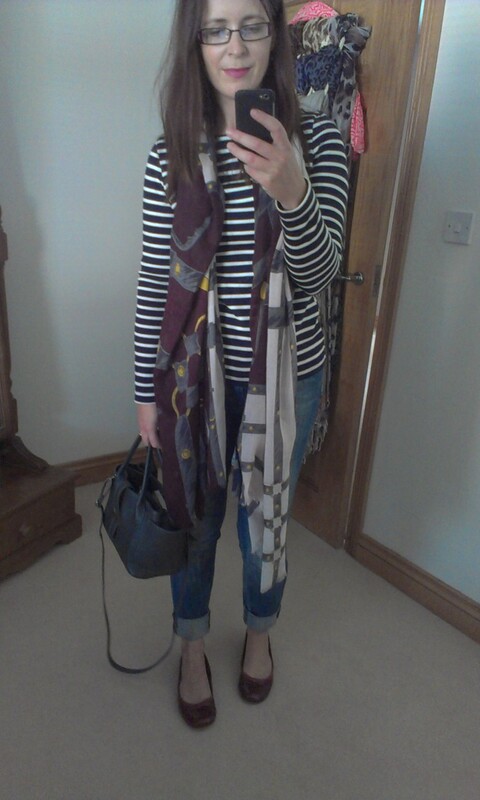 Jeans are my Maison Scotch bargains that I am struggling not to wear most days as they fit so nicely. 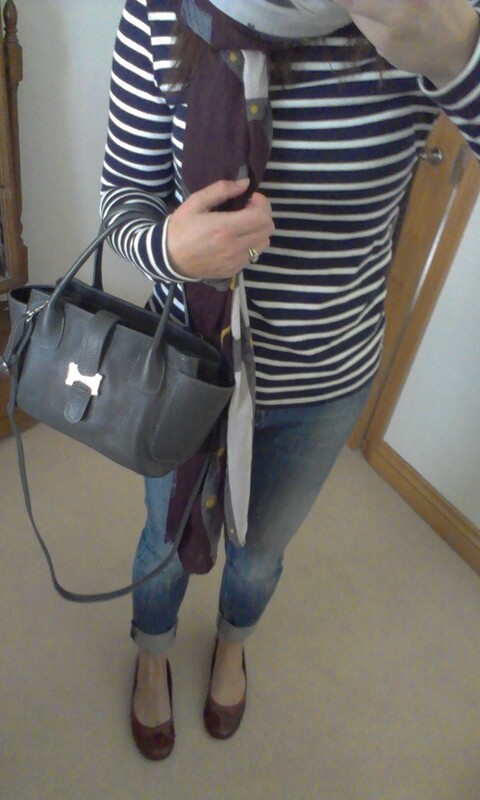 Tuesday, it was the turn of a Petit Bateau breton that I got from Atterley Road back in May or June. It's the most amazing quality and a lovely weight - perfect for autumn though unfortunately out of stock now. It was a nicer day today, so the ankles got out for a dander and I didn't need a jacket. Same jeans today...was a grab and run kind of getting dressed today! Sorry about the mirror selfies - my budding photographers are in school all day now! Will have to dust off the tripod tomorrow! I reviewed The Light Between Oceans last year and loved it...when I stopped crying! 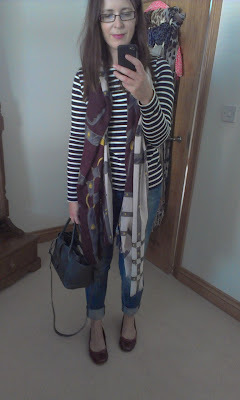 I have a little query re the BF jeans as I'm considering dabbling ... how to wear them in cooler seasons. Would socks peeking above ankle boots look silly or not? Oh my...I sobbed all last night finishing it. And am still thinking about it today! So happy Autumn is here and we can wear our scarves again! 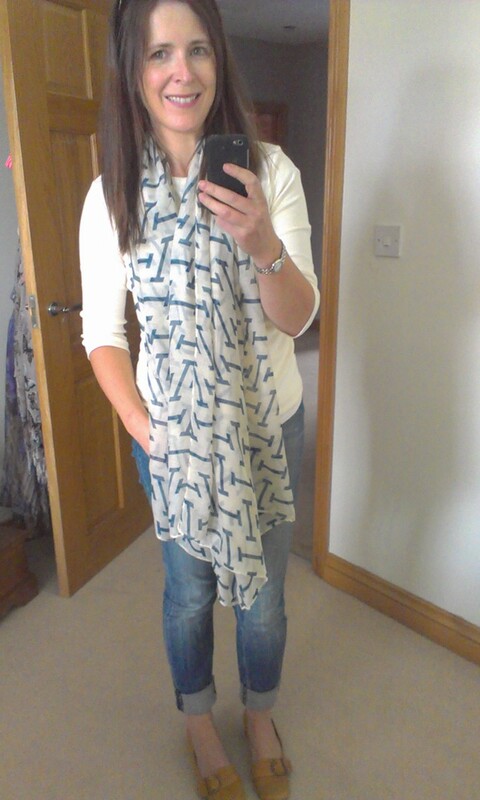 I'm so happy that we can finally get out the autumn tops and scarves. Avril, I love that shawl! I've worn Petit Bateau bretons for years and years. In fact, most of my basics are from PB along with nearly half of Lil L's wardrobe too. Lovely quality and they just last and last. Hi Avril, really cold over here in Warwickshire - yep the temperatures have really dropped + the evenings, in particular, seem very chilly. I came to work yesterday without a scarf and as it turned windy (and I don't 'do' wind) I had to go out at lunchtime and buy one! 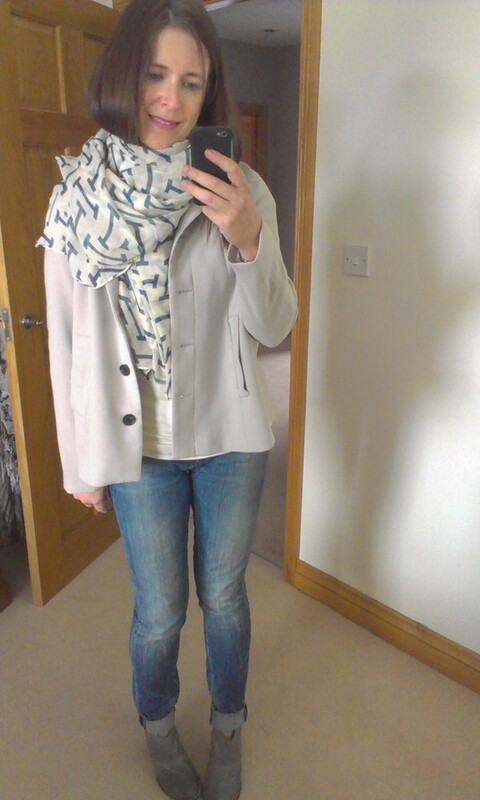 Managed to get a lovely grey + pink ex New Look one from a local charity shop and I'm actually wearing it as I type this! I'm impressed with your mirror selfies;) Love your ebay finds, need to have a hunt online! Think I'm getting ready to start shopping for scarves again! !